The PCT's southern terminus at the tiny outpost of Campo is in arid, semi desert, chaparral terrain and that is one of the main features we would encounter in Southern California. The route of the trail keeps for the most part to high ground, thus avoiding the worst of the dry hot areas. 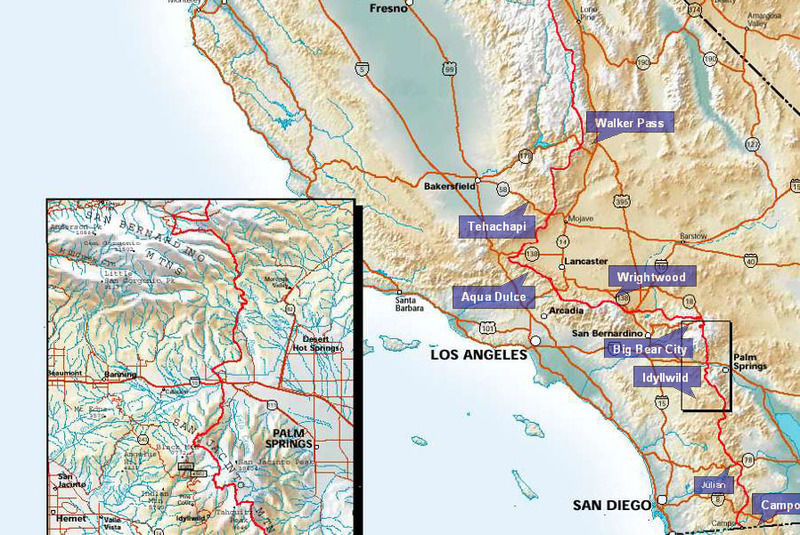 However there are many small mountain ranges crossed from Mt Laguna, San Jacinto to the San Gabriels north of LA and snow lingers on these ranges into early summer. On the higher altitudes we could expect pine and cedar forests which would give us much needed shelter. We could cross arid desert and the next day find ourselves on snow covered hills and thus we had to consider carrying gear for both hot and cold conditions in these first few weeks (as a result we received a few strange looks walking in the desert with ice axes attached to our rucksacks!). So the country we would be crossing would not be mountainous particularly but would give us a fresh new experience of semi desert hiking and perhaps some easier hiking than we could expect later on. Our main adversaries we thought when starting out were ; to avoid injury and build up our stamina slowly, ensure we get enough water, rattlesnakes, sunstroke and avoiding any 'gun-tottin' locals! 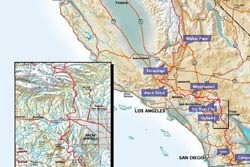 The Southern California section finishes at Walker Pass- a major east-west road crossing -Hw 178- and near the foot of the higher Sierra Nevada mountains of Central California to the north. We had a week to spare based in LA before our intended start date around 25th April and we managed to drive out for two days skiing near Big Bear City and to climb Mt Baden Powell which, at nearly 10,000 ft, is the PCT's highest point in southern California. The mountain was packed with snow on its tree lined slopes and provided an energetic 3000ft climb to its summit. The weather systems accompanying El Nino have been blamed for an unusually large amount of snow on the high ground and it was handy to see what this meant for our intended walk as it could have a major impact on our progress across hilly terrain.